Spring is eight days away, but who’s counting? With the new season, you might find yourself doing a little spring cleaning. For me, it’s therapeutic. I love purging, sharing what I no longer use and adding a few seasonally appropriate pieces along the way. This mantra can apply to work, too. Whether you want to get a handle on your email (inbox zero, anyone?) or improve your punctuality, now is a great time to focus on workplace organization. If you aren’t sure where to start, consider beginning with cleaning up your workplace interactions and vocabulary. For example, when you receive a request for help, what is your initial response? Your gut may tell you to say “no,” because you’re too busy, not clear about priorities or even burned out. 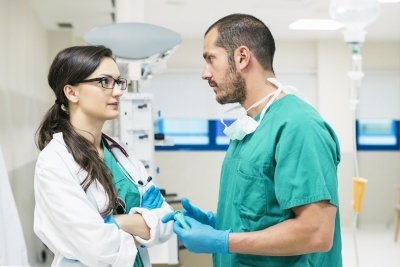 On the flip side, it may be in your nature to instantly jump into action (most healthcare professionals I know are like this), perhaps because you’re a team player or dislike conflict. It’s natural to want your co-workers to like you, so you may take on more than you can or should do. But agreeing to help when you don’t have the time or right intention can set you, your co-worker or project up for failure. So, how can you be a team player without over-extending yourself? One way is by throwing out the toxic phrases that sneak into conversations when you are stressed or overwhelmed. You’ll get more out of your interactions with co-workers by carefully selecting the words you use. This will help ensure your ideas—and the intentions behind them—are understood and well received. Throw away: "We've always done it this way." New and improved: "I appreciate your suggestion. How do you see an alternate method/process/idea being more effective for us?" When you respond this way, you are encouraging open communication and demonstrating that you can be persuaded to do things differently if you are convinced of a better result. Throw away: "That's not my problem." New and improved: "What resources do we have to address this concern? I'd like to help you but I may not be the right person to assist given my role and other high priority projects." There is nothing more frustrating than someone telling you, “it’s not my problem.” It isn’t helpful and is far from acting like a team player. By asking questions about the situation and explaining why you may not be the best person to help, due to a limited role or time restraints, there is a greater understanding of why another option is needed to quickly solve the problem. Throw Away: "There is nothing I can do for you." New and Improved: "I see why you are struggling to get answers. Who would be a better resource for your questions? Let's figure out who you can talk to next to get the support you need." Instead of throwing your hands up in the air, put on your thinking cap and offer a suggestion or point them to someone who may be better able to assist. You can provide support by encouraging the person to loop back if they hit a dead-end and aren't sure where to go. This will make them feel heard and supported—and possibly mean you won’t need to add another item to your to-do list. Ultimately, before you jump to your gut response, pause a moment and consider another perspective: what if you were tasked with the same project or problem? How would you like someone to respond to you if you hit a dead-end on a project or were frustrated? Spring cleaning toxic phrases enables you to go the extra mile to support your team and minimize the chance of getting pulled in on a project or problem you don’t have time for. What success have you had with cleaning up your workplace interactions? I invite you to share your experiences in the comments below. Laura Gmeinder is a Cassling Investing in You seminar speaker. She is a leadership coach, HR business consultant and motivational speaker. Laura’s background focuses on adult learning. She earned her Bachelors of Science from the University of Wisconsin - Madison. She is a certified Professional of Human Resources (PHR) and has taken life coach training. Laura is also an engaged community leader.